The Balkan media are dominated by stories about the imminent collapse of multi-ethnic Macedonia. But what is really going on in the country? A commentary by Vladimir Gligorov. The Balkan media are dominated by stories about the imminent collapse of multi-ethnic Macedonia. European, US and Russian commentators are also speculating about the ethnic clashes in that country and in the Balkans in general. This is basically how Balkan politics has been seen by journalists and politicians for a very long time and in particular since the break-up of Yugoslavia. Hugely inadequate and indeed misguided political interventions have ensued from this lack of knowledge and understanding, that inadvertently supported ethnic nationalists by adopting their interpretation about the Balkans being a region with eternal tribal animosities. 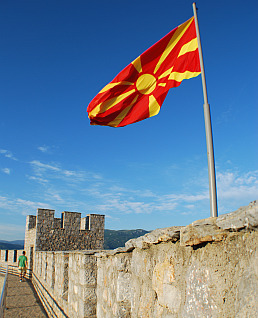 Macedonia is the most recent example. It is not hard to see what is going on in that country. The Macedonian party, VMRO (Macedonian Revolutionary Party, nationalist), which has run the country for a decade now, is bound to go into opposition. Its Albanian coalition partner, DUI (Party for Democratic Action, a descendent of the 2001 uprising), does not have enough of a support to continue in the same coalition, because the opposition Albanian parties won more votes (in December 2016, early general elections), though only an equal number of seats in parliament. These electoral results are an answer to a prolonged legitimacy crisis, due to, let us just say, widespread corruption. A coalition government of the opposition Macedonian party, SDSM (Social Democrats), with one, two or even three Albanian parties is the legitimate democratic outcome. That may lead to new early elections at some point down the road, but the change in government should enable that rule of law is re-established or is at least strengthened. The President of Macedonia, who is from VMRO, disagrees. He wants to see the programme of the new government coalition and in particular wants SDSM to renounce the platform of the Albanian parties, which he believes aims to destroy Macedonia as a unitary state. Many Macedonians have gone to the streets to demonstrate in favour of unitary Macedonia. The leader of SDSM has presented the programme of the new government, which is to be formed as soon as the President is ready to give the mandate to SDSM and its coalition partners. All that, except for the behaviour of the President, is quite within the democratic political process. What is happening in Macedonia is a democratic change of government, which the President is attempting not to allow. He, and his party, VMRO, would rather like that there is another round of early parliamentary election. The hope is that by polarising the ethnic vote, VMRO, as a nationalist party, will come ahead. Even in that case, the government would have to include one or more Albanian parties. However, the opposition Macedonian party, SDSM, would be kept out. That makes it clear that this is about keeping SDSM out while keeping VMRO in – no ethnic conflict or even competition is involved, let alone that it is driving the political conflicts. Democracy and stability of a multi-ethnic country like Macedonia depend on the existence of party competition at least within the two major ethnicities, the Macedonians (about 65% according to the last, 2002 census) and Albanians (25%), which is what there is. For that structure to persist, it is necessary that parties from both ethnicities come in and go out of the government, which is to say that there is democratic change of government. The aim of VMRO is to delegitimise SDSM on nationalist and patriotic grounds and become the sole representative of the Macedonians. Then, indeed, all conflicts would be ethnic and not democratic. That this is the case is clear from the approach that the President has taken. Even if there is an intention on the part of the Albanian parties to seek more constitutional rights than they already have, their political demand is not illegitimate, though unlikely to be easily incorporated in the constitution. Any change to the constitution requires a two-thirds majority, which is hard to achieve within the existing party division. So, the President’s intervention is not needed even if he has as grave doubts as he says he does. And indeed, the public support is not there, as is clear from the ongoing demonstrations. This being the case, the only issue is how long the delay to re-establishing the governing institutions will last and how great the damage is going to be. But the country will take the democratic way out.